AUSTIN, Texas – March 20, 2013 – TrustRadius, co-founded by former Convio founder Vinay Bhagat, today announced the launch of the company. TrustRadius is a professional community designed to help enterprise technology users and decision makers discover, evaluate and share best practices through in-depth, user-generated reviews, discussions and social networking. TrustRadius is currently in private beta, building a foundation of reviews and a core community of members dedicated to sharing insights and perspectives on software regularly used in the enterprise today. The company plans to launch a public beta in early Q2. Highly Qualified and Safe Community: The TrustRadius community has largely been built through targeted outreach and member referrals. The company is targeting primary users and buyers of enterprise software products who are able to provide in-depth, pragmatic insights. Every contributing member is authenticated via his or her LinkedIn credentials and email address. Members are prohibited from reviewing their own or a competitor’s products. Identity management controls allow reviewers to maintain privacy or confine their visibility to a controlled audience, enabling candor and honesty. In-Depth Structured and Authenticated Insights: Each review is structured to help buyers quickly and easily have a comprehensive view of a piece of technology. Each review is checked by a TrustRadius researcher before being published to ensure it is complete and clear. Reviews are augmented with technology-related strategic discussions. 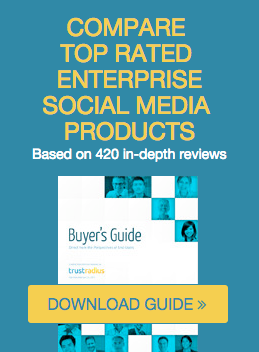 Trust-Based Social Networking: TrustRadius members can follow products, vendors, categories and other members. TrustRadius also facilitates connections between members on LinkedIn to enable offline conversations. Content rankings, badges and reputation scores help members gauge the quality of a reviewer’s opinion. Comprehensive, Clear Product Directory: TrustRadius is building a comprehensive and clear product directory. For example, in the Social Media Management Software category, the company features close to sixty different products. By contrast, traditional technology analysts and product listing sites tend to feature five to ten products in a category at most. TrustRadius also invests in helping its members easily comprehend, in simple terms, what a product does, related products, competitive products and integrated products. Authentic Business Model: TrustRadius does not charge vendors to be reviewed to help ensure a level playing field. Vendors are prohibited from soliciting within TrustRadius and from attempting to bias reviews. Bhagat conceived the idea for TrustRadius based on his experience as an executive seeking authentic and comprehensive feedback on technologies that Convio sought to implement. Convio was the leading provider of Software-as-a-Service solutions to the nonprofit sector and was acquired in 2012 for $325M after going public in 2010.